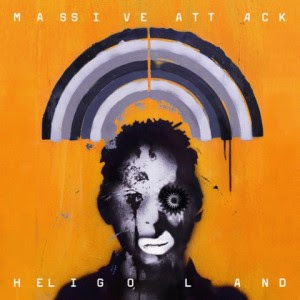 Heligoland is a good example of what Massive Attack driving force, Robert Del Naja, has claimed his ambition for the group was to inevitably become. Less a 'band', than a collective of musicians - varying with each release. The amount of different lead vocalists on this release (more than ever before) exemplifies a lot of that ideal. For example, Del Naja himself doesn’t even really speak a whole song until more than halfway through, plus, much like the last album, cover your ears for second and you’ll probably miss Daddy G’s minor involvement vocals wise - appearing only briefly on the third track, ‘Splitting the Atom’. Breaking contemporary electronic music ground is not something MA really provide anymore, but considering what they have done for the scene in the past, it's forgivable that they are now a different beast. Plus even though their last effort, 2002’s 100th Window was a stellar release, it did not contain anything as influencing or immense as ‘Angel’ or ‘Inertia Creeps’ for example. This is similar territory to that album, though Land is not without its own standout tracks. ‘Girl I Love You’ is an instant Massive classic, with a throbbing bass line meandering under the always-stellar contributor Horace Andy’s vocals. With Heligoland, they have definitely settled for expanding themselves as artists, still making sophisticated electronic music, just perhaps not the overly innovative type some may still expect from the Bristol duo. Production wise it is certainly a very mellow listen. Many of the songs felt like 100th Window ‘s style melding with something a little more off the wall, like Bjork’s Vespertine, with maybe a bit of Radiohead's Amnesiac. Harsh, bass driven trip-hop beats are less favourable now, rather creating an atmosphere within each track is the order of the day. The whole album is extremely hypnotic. The distinct vocals of Del Naja and Andy add to the Massive signature flavour, but the likes of Elbow‘s Guy Garvey, Hope Sandoval and TV on the Radio’s Tunde Adebimpe bring a new uniqueness to the production. Overall, it is impressive enough if not as much so as the superior 100th Window. No denying it though, that bass line on ‘Girl I Love You’ is one phat muthafucka! People forever hoping for Mezzanine Part II will obviously be disappointed with Heligoland, as they probably were with the last album. All I can say is that over the last ten years, the lads have matured, mellowed out and their priorities are obviously very different. If this is what we can expect from the name Massive Attack in the 21st century, I myself, am certainly not going to complain. Protection, Blue Lines and Mezzanine will always be there, serving their place in contemporary music history. Perhaps it is still hard for some to accept their heroes have moved on. The only downer? It'll be about seven years before we get another one.